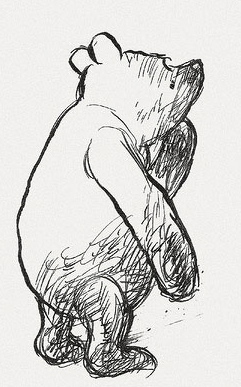 One of my first memories around the amazing power of storytelling comes from reading the A.A. Milne classic with my mom. We were sitting in this old blue chair, and she was telling the adventure when Pooh gets his head stuck in a honey jar (Silly old bear!) while stuck in a hole he had dug to capture a Heffelump. Do you remember this bit? Well, Piglet, being Piglet, wanders over and thinks he has captured a Heffalump. The experience is too much for Piglet and he stutters, messes up his words. I don’t want to say more, but it is hilarious, especially for a three-year old. And that moment, right there, is what I remember. I remember laughing with my mom so hard that it hurt. A picture didn’t cause that laughter, or a TV show. No, that was simply words on paper, and thanks to those glorious words I could see it all in my mind. That realization, that blessed moment, was important to me. And finally after wiping my eyes I had to ask my mom to read it again. To which, she happily agreed. I used to be obsessed with the work of Benjamin Hoff. Benjamin Hoff wrote The Tao of Pooh and The Te of Piglet, wonderful books for understanding the philosophy of Taoism through the stories of A.A. Milne. Now, granted, there is no reason to believe Milne had any knowledge of ancient Chinese philosophies while creating his children classics. They were simply inspired by his son and his toys. Yet, the books work for this philosophy and Hoff was the genius that saw that and made it digestible. Sadly, we won’t get any more books like that from Hoff. He has been having a very public argument going between him and his publisher. For decades they have treated him and his classic horribly, while still having no problem collecting the financial return those books continue to generate. It had gotten so bad that Hoff wrote a piece on his site stating his retirement from publishing. A shame. For me, finding that book and that philosophy was a revelation. I had always been a very inquisitive kid, never being happy with faith and religious beliefs for answering the big questions about life and death. But, for some reason, the idea of simply “because” was enough for me. A bear did that. The Tao of Pooh gave me that feeling of peace for a time. And throughout college one of my favorite shirts to wear was a T-shirt recreating the cover image from the book. I can’t even begin to count the amount of graduates and birthdays I have given the first book to; I used to have a pile on standby. Yet… Have you ever tried to give The Tao of Pooh to someone? It can be kind of awkward. Now, if the recipient knows something about the book, well, they might simply be grateful. But I have also seen people look confused by the gift, and have even had one person look insulted by the book (to be fair, I used to tease this person for not being a reader). When I graduated from college, I planned a six-week solo excursion to Europe. This is the traditional college student out in the great world trying to find himself and his voice. Yeah, it’s a stereotypical trip, I get that, but I was planning to relish the experience, and prepared every step of it months and months in advance. One of the things I wanted to do, needed to do, was find the real 100-Acre Woods. Yes, it is out there! It is not easy to get to though. I had to take a train, then a bus into a small village. I almost worried I was in the wrong area until I found this little bookstore underneath a bigger store. That bookstore was all about Pooh bear. The owner behind the cash register gave me a map. and showed me the hike I would need to take to get to the location (also begged me not to bother the current owner of Milne’s home; I guess he can be grumpy). It was a fun hike, climbing over fences, walking past sheep, until I had reached the landmarks straight from my childhood. There was the actual Poohstick Bridge, the Enchanted Place (which had a small plaque for Milne’s creation, the only marker that you were in the right place), etc. It was the mecca for children literature and I had found it. I think I spent a good few hours sitting on that bridge, dangling my feet over the side, lost in thought. All I was missing was a few stuffed creatures to play the game with me. When my wife and I had children, we made a pact to avoid television until the age of two. And when we reached that age, one of the first things my son asked to see was Disney’s classic The Many Adventures of Winnie-The-Pooh. I can’t even begin to guess how many times my son has sat through that movie since. There were days that we would begin it before we had to leave for work, and end it after he got home. He was obsessed with Tigger, even being him once for Halloween (he still wore the costume for days after). He could bounce and sing the Tigger theme song before any other song reached his lips, and that is not an easy song to sing as any “T-I-double grr-er” can tell you. A few months after he started watching the movie religiously, I had to make a trip to Los Angeles, and ended up at Disneyland with my sister-in-law. It’s not surprising I went to Disneyland. I am kind of obsessed with the place (my dream when I retire decades from now is to move to Anaheim and work the front door of the Haunted Mansion, greeting each guest to the sacred ride, asking them to step into the “dead center” of the room). 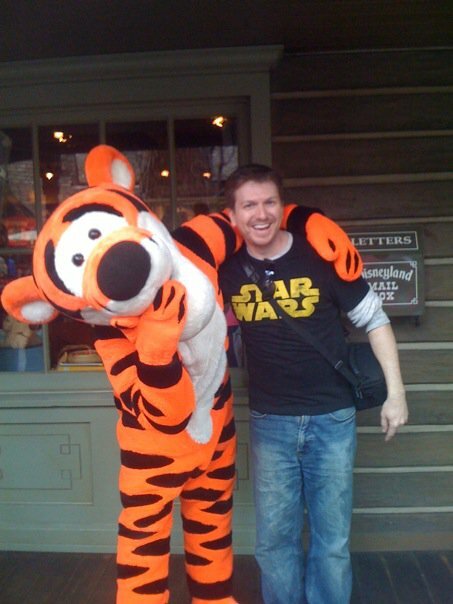 This time, I had to get a picture of myself and Tigger for my son. Tigger, of course, was obliging and we both smiled at the camera. Of course, later my wife pointed out to me that someday my son might be annoyed that I went without him and a picture of me with his hero might not have the effect I was aiming for. While I love Disneyland and many of the Disney movies (the Indian scene in Peter Pan still makes me feel uncomfortable though), the fact is Disney in the long run has done more to harm the image of Pooh over the years than help it. Yes, they introduced Milne’s classic to the American audience (Heck, it is the reason Disney did small films to begin with the character, worried that they would lose money starting with a feature film), and while I thought the movie released in 2011 was wonderful (John Cleese was the narrator! ), everything in the decades between the two major film releases have been… just awful. Badly made movies for video (I still don’t understand a lot of what happens in Piglet’s Big Movie including why Carly Simon is there), and TV shows where he becomes a super hero (No, I’m sorry a super detective); yet, the worst is every “original” story they had written around the character. I don’t know where Disney found these children authors over the years. It is quite an art to find and publish such a collection of bad writers, but they have consistently done it. There should be an award. Each book is drab, each book misses the humor you would find in the classic tales by Milne. How could so many writers completely miss the point and spirit of the original creation? You can’t help but think that these books were written by a computer as compared to someone who claims to have a soul (or, in the least, a childhood). Yes, I believe Disney has hurt the silly old bear in the long run and caused this awkward mess. I wonder what Milne would have said about all of this? Especially since he gave his beloved character such a clearly defined ending in the books. My son is five now, his Shepherd sketches of the bear of very little brain and map of 100-Acre Woods on his bedroom walls are now replaced by superheroes and comic books. He has a younger sister who is two. While she loves Cinderella, she still asks for Pooh from time to time. Recently, I was up early with her and we were watching the classic Winnie-the-Pooh together, she snuggled up against my arm. “I can’t believe you want to watch Pooh.” He said, a little annoyed. And then he sat down next to me, rested his head on my shoulder, and watched the rest of the movie silently. He might have even secretly smiled. If you liked reading my article, why not check out some of my published books? I’ve had three novels published in the last few years, the new A Jane Austen Daydream, My Problem With Doors and Megan. You can find them via my amazon.com author page here, or Doors and Megan as an eBook on Google eBooks here. Thanks for reading! This entry was posted in Books, Parenting and tagged 100-Acre Woods, A.A. Milne, Benjamin Hoff, Childhood, Children's Literature, Disney, Disneyland, Family, Fiction, Growing Up, KidLit, Life, Parenting, reading, Tao of Pooh, Te of Piglet, Tigger, Traveling by Scott D. Southard. Bookmark the permalink. Very sweet. Pooh is (was) a big part of our family too (he’ll be making a comeback with g-baby Silas). I love the classic works–hate the new stuff (flat-out annoying). The 2011 movie with John Cleese was really great. But, yeah, everything in the 80’s through 2010 was pretty bad. Thanks, Scott. Pooh is us and we are Pooh… destined to always wait, be wrong more than right and not know why, and to be obsessed with finding the honey tree. Milne’s work was and still is deeply spiritual for me. Funny, too! I still love Winnie the Pooh at 19 years of age. It is good to know that someone out there older than me likes him too, if only to justify my purchase of Winnie the Pooh Stuffies to my parents. I disagree a bit with you on Disney’s Winnie the Pooh original stories. I grew up on the The New Adventures of Winnie the Pooh cartoon, and I still enjoy it. Even as an adult, I still find the humour hilarious (Tigger especially uses a lot of hidden adult humour) and some of the stories are genuinely dark and creepy or witty. I do agree that the latest one where Pooh becomes a super detective in that awful outfit (because the bear of very little brain would be a great detective, yeah) is terrible. LOL. Well, he is definitely the last person I would hire to solve a mystery. Even if Tigger is with him. And who the heck is Darby? How did she get into Christopher Robin’s imagination? My three year old daughter is just now getting into Pooh. Sometimes I sit and watch her watch Pooh, which makes me love Pooh even more. And thanks, Scott, for responding to my emailed questions. Not a problem. Glad to help! FYI, the Tigger movie is a little depressing but has some fun moments, Piglet’s Big Movie is awful, but the new film from 2011 is great. Oh, if you want to check out my new book, I’ll consider it even. LOL. A sample is sitting on my kindle. Once I finish The False King I will see where the sample of your book leads me.